Bullmastiffs are the perfect example of a gentle giant in the dog world: muscular and powerful, yet faithful and kind unless provoked. He is an English creation that has found a loyal following in this country. Here are 9 fun factoids about the strong and silent Bullmastiff. A close up of a Bullmastiff. Photography by DNSPhotography/Thinkstock. What we know of the Bullmastiff’s history dates back to mid-19th century England. Gamekeepers needed a dog that would help them rid the large estates and game preserves of poachers; one that could cover ground quietly and pin the trespassers without harming them. Breeders crossed the Mastiff with the now-extinct Old English Bulldog to ultimately come up with the Bullmastiff. The Bullmastiff represents an ideal blend of 60 percent Mastiff and 40 percent Bulldog. The gamekeepers’ goal was to create a dog that was faster and more aggressive than the Mastiff, yet bigger and less ferocious than the Old English Bulldog. This is a sizeable breed, with adult males reaching a height of 25 to 27 inches at the shoulder and weighing 110 to 130 pounds; females reaching a height of 24 to 26 inches at the shoulder and weighing 100 to 120 pounds. 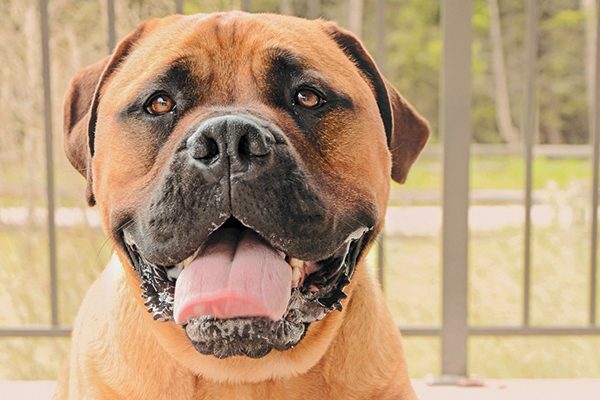 Yet Bullmastiffs are mellow and laid-back, not requiring much grooming or exercise, and they make wonderful companions for urban owners, adapting well even to apartment living. They are quiet dogs and rarely bark. The breed standard for the Bullmastiff describes its temperament as “fearless and confident yet docile. The dog combines the reliability, intelligence and willingness to please required in a dependable family companion and protector.” They are a lovely companion to live with, gentle with the smallest child yet exuding an air of protective authority. A Bullmastiff sizes up against a young girl. Photography by Eduard Ly Senko/Thinkstock. Bullmastiffs are powerful dogs, yet sensitive. Given the breed’s strength and inclination to be independent, early socialization and training are essential. Bullmastiffs are natural guardians of their people and property. No guard training is necessary; a Bullmastiff will respond appropriately if its family is threatened. The most common color seen in Bullmastiffs is fawn with a black face mask. Bullmastiffs also come in darker red shades. Brindle Bullmastiffs have black stripes over a fawn or red background. Although they are less often seen today, the dark brindles were preferred by the gamekeepers who created the breed. The stripes provided the dogs with better camouflage, particularly at night, hence the breed’s nickname of Gamekeeper’s Night Dog. 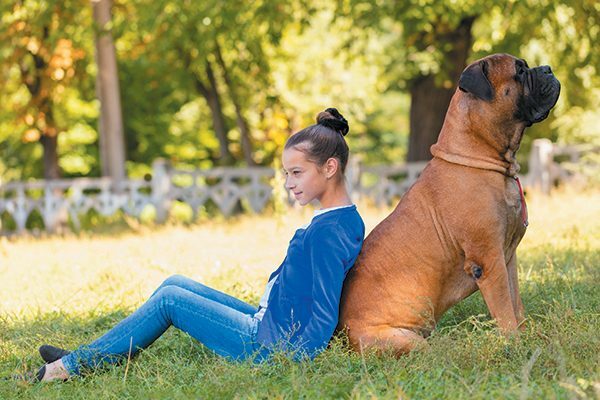 For all the Bullmastiff’s virtues as a devoted companion and guardian, he shares with many other large- and giant-sized breeds the heartbreak of a shorter life span. While there are exceptions, a Bullmastiff typically lives for 7 to 8 years. Many dog-loving movie fans got their first look at a Bullmastiff in Sylvester Stallone’s original Rocky. The down-and-out boxer had a Bullmastiff sidekick. Interestingly, it was Sly Stallone’s own dog, Butkus. Singer and songwriter Bob Dylan owned a Bullmastiff, Brutus, who appeared regularly with him. In the reality TV series Little People Big World, the Roloff family owned a Bullmastiff named Rocky. And in the world of sports, the Cleveland Browns football team has a Bullmastiff named Swagger as its live mascot. Allan Reznik is a journalist, editor and broadcaster who specializes in dog-related subjects. He is the editor-in-chief of Dogs in Review and the former editor of Dog Fancy magazine. A city dweller all his life, on both coasts, he now enjoys the rural South with his Afghan Hounds, Tibetan Spaniels and assorted rescues. The post 9 Reasons to Love Bullmastiffs appeared first on Dogster.